When it comes to cooking magazines, I’m a big dork. I like to organize my magazines by month, so at any point mid-season I can find appropriate recipes. At the beginning of January, I pulled out several January and February issues to discover a section on peanut butter desserts in the January 2009 issue of Bon Appétit. Seriously, how did I miss that the first time around?!?! 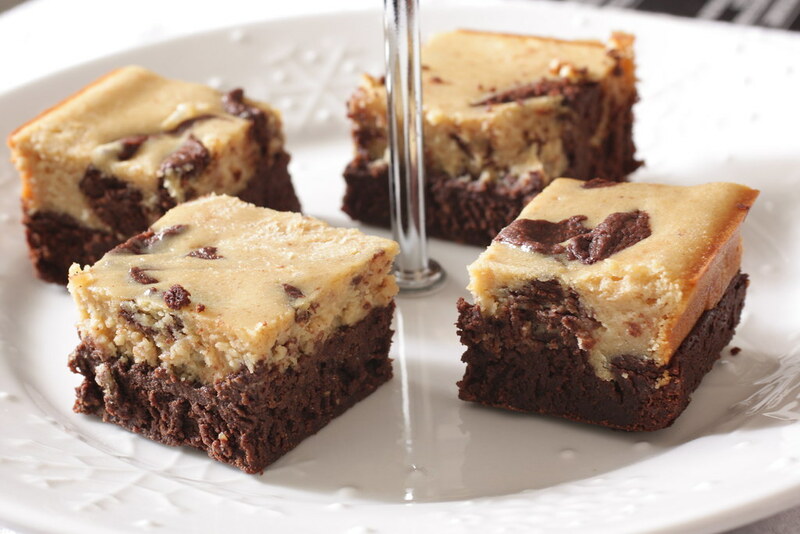 I lovingly pored over each picture and recipe and ultimately decided upon a recipe for peanut butter and chocolate cheesecake brownies. The peanut butter swirl brownies I made last year were good, but a friend complained that the pure peanut butter swirl stuck to the roof of his mouth too much, so the brownies weren’t his favorite. He’s not one to mince words, but he’s also not one to not eat brownies for that silly of a reason. 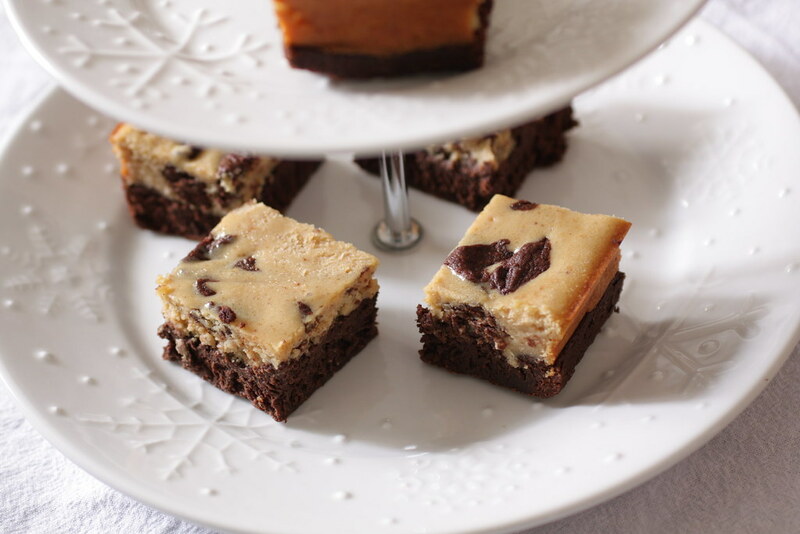 This recipe is decadent and probably one you want to save for a special occasion. In my case, I suppose I could call them “I Got a New Job Brownies!” Or how about “My Car Actually Starts Again Brownies!” If those aren’t reasons to celebrate, I don’t know what is. Preheat oven to 325*F. Spray 8 inch square metal baking pan with cooking spray. Bring water to a simmer over medium-high heat in a saucepan. Combine chopped chocolate and butter in a heatproof bowl and place over simmering water until smooth. Remove from heat and cool for 10 minutes. Using electric mixer (use paddle attachment for a stand mixer), beat sugar, eggs, and vanilla on medium speed until fluffy (about 3 minutes). Reduce speed to low and beat in melted chocolate, then salt and flour. Spread batter in pan. Using electric mixer (use paddle attachment for a stand mixer), beat cream cheese, peanut butter, and vanilla on medium speed until combined. Add sugar, then add eggs one at a time. Beat in half and half, then flour. Reserve 1/3 cup of cheesecake batter in a small bowl, pour remaining batter over brownie layer. Melt remaining chocolate in microwave on high for 20 second bursts until smooth. Stir chocolate into reserved cheesecake batter until combined. Place dollops of chocolate over cheesecake and swirl with a knife. Bake brownies on center rack until edge of cheesecake is puffed and the center is set, 35-40 minutes. Cool brownies on wire rack. Cover and refrigerate two hours or overnight. Cut into squares and serve cold. I just made these today! They were pretty good, but not peanut buttery enough for me. Next time I’ll double the pb and it’ll be perfect! Tia, I agree that more peanut butter would have only made them better. peanut butter and chocolate- Cant go wrong with that. Add cream cheese to that combo and i think we have an absolute winner! Thanks – this is definitely a dessert I will make again!